You are currently browsing the tag archive for the ‘mustard yellow’ tag. I’m considering my version of ‘Jeffrey Bernard is Unwell’, as printed in The Spectator when the late journalist had been rather too drunk or hung over to write his Low Life column. Mine will have to be shorthand for truly being unwell rather than drunk (I say this while slurping a Bailey’s at ten past midnight)! In the meantime, nothing new has been diagnosed and no new art created to display. This is one from the past that I’m very fond of. It was seeing this quote in an iPhone app that inspired Garlic is for Heroes, which I created with a photograph from Wikimedia and a texture overlay from, yes, 2 Lil’ Owls. It was an interesting reversal of my usual method where a visual idea comes first. I was so taken with the quote, I had to do something with garlic! 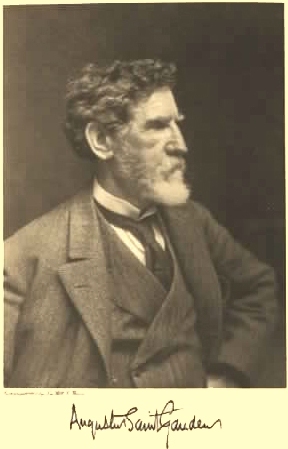 Augustus Saint-Gaudens by De Witt C. Ward via Wikimedia Commons. As Garlic for Heroes has just been featured in the Food for Thought group at Redbubble, here it is for your delectation (or not, of course) in a frame. Fear not, sweet tote-loving readers, I’ve also included the bag below since it would be perfect for shopping!